Top cinematographer has worked with Alan Parker, Mickey Rourke and Ryan Gosling, but this project is far from the hustle of Hollywood. 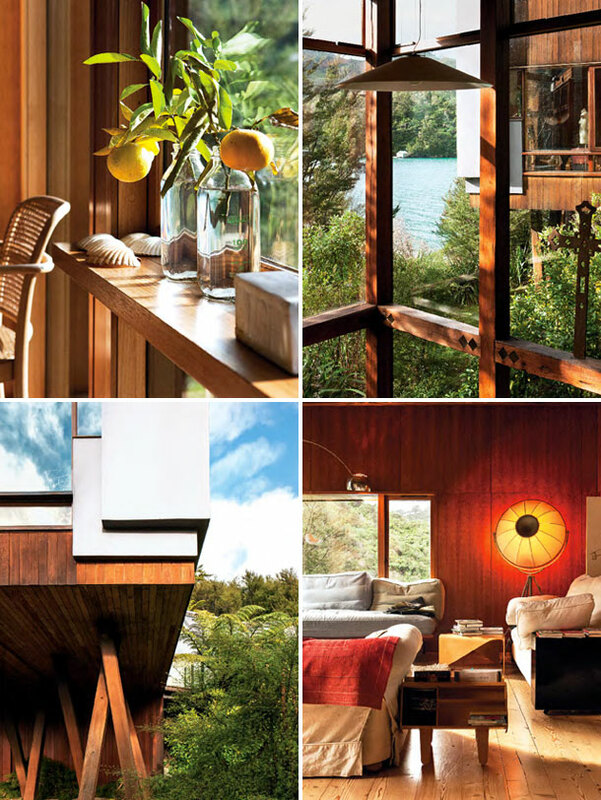 Created from salvaged wood in New Zealand’s in country, his house at Waterfall Bay can now be cast in a blockbuster of your own scripting. In spite of this complicated relationship with his native land, or perhaps because of that, in 1989 he bought 75 acres on the inner Queen Charlotte Sound on South Island. On this plot, dotted with cabins and campsites once used by holidaymakers, there was also an old house — among hills thickly forested in native tree ferns and manuka — with a waterfall cascading behind the property, which Seresin says can increase 50-fold from a trickle to a roaring cataract, depending on rainfall. Seresin used that old house for 10 years — ‘it was simple but I loved it’ — but then decided to embark on designing a new home. The need came about because he had bought some grazing land in the region, which he had deftly turned into a vineyard. Two more land acquisitions followed — which became Tatou and Raupo Creek vineyards — and soon he had distributors flying halfway around the world to taste his wine. The best way to arrive at Waterfall Bay is by boat, a 10-minute ride by water taxi from the port of Picton. The house emerges, its wooden corners, graphic edges and watery reflections peeping through the trees. There are decks and terraces all around the building with fixed louvres for shade. Big-paned doors and glass windows slide open. Natural light floods the open-plan spaces. There are bleached Oregon pine floors, and beams and supports in the Australian hardwood jarrah, salvaged from ports and viaducts. At the heart of the property is a large space for cooking, eating and reading (Seresin’s taste in literature includes Tom Wolfe; biographies of Enzo Ferrari, Tony Benn and David Lean, as well as plenty of poetry). Surrounding the large fireplace are three sofas: an Eilean Gray Lota, a Conran and a third, nameless, that serves as a daybed. The room is lit by a mid-century Castiglioni Arco lamp, and a Fortuny from the same era. There’s a table hewn from the keel of an old boat; upon which is a collection of Maori toki, chisel-like stone tools. The mantlepiece props up an antique Indian shrine and family photos. By the stairs there’s a white ceramic sculpture by New Zealander Raewyn Atkinson, made from moulds of food cans she found in explorer huts in Antarctica. Although it may not be for much longer. Seresin is opening up Waterfall Bay to rent, going beyond invitations to family, friends and guests of the vineyard. ‘It’s a place that really needs to lived in,’ he says. There are three bedrooms and bathrooms: two are downstairs, more like studios than just places to sleep. ‘So you can be sociable but there’s a lot of privacy, too,’ Seresin says. The wine cellar abuts these bedrooms. Seresin’s own rooms are set apart from the rest of the house along a 10-metre suspended glass walkway. Furniture is a mix of Scandinavian and Conran — with a sheepskin rug on a stool. The light by the bed is a Frank Lloyd Wright Taliesin studio, and above hangs a large wooden heart made of driftwood. In the bathroom stands a big Japanese soak bath in teak. The art includes a framed poster from a movie he worked on, Birdy, and there’s a painting of Joseph, one of his six children. But it is the view of ferns, sea and the sky that is the centrepiece. Anyone coming to Waterfall Bay has the run of the whole house. The wine estate can provide a cook and a housekeeper can fill the fridge, or guests can be self-sufficient: picking salad leaves in the vegetable garden, citrus fruits from the trees, collecting cockles, clams and green-lipped mussels on the beach, and buying supplies at the local farmers’ market in Blenheim. Days are spent immersed in nature. Swimming in the bay, picnicking on the shoreline or tramping along the 40km Queen Charlotte Track which passes behind the house. Moored in the bay is Seresin’s sailing boat, a Bridgedecker called Rukutere; in the boat shed is a vintage Riva Tritone Aperto that he bought on the Thames and had shipped here. Guests can putter about in a motor boat fishing for bream, kingfish or grouper and there are kayaks to explore the Sound; further out you can go spear-fishing or diving for scallops.